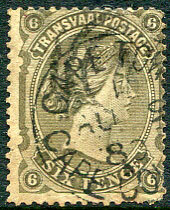 dated I/AU 9 80 on Transvaal QV 6d (SG.137a), minor perf. faults. dated I/JA 23 83 on EEN PENNY on QV 4d (SG.170), blunt corner perf. MY 26 01 on 1d (SG.59a), stamp slightly tired. 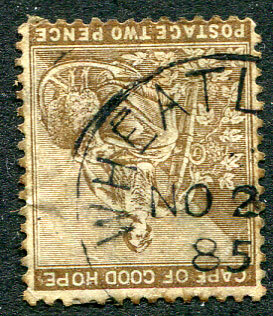 NO 2 85 on 2d (SG.42a), some soiling. (CDS) AU 10 06 on KE7 1d (SG.71), minor faults. 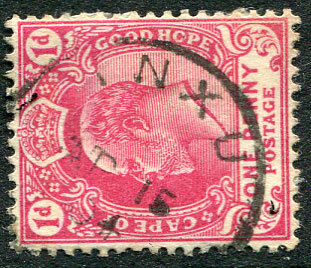 (CDS) NO 21 83 on 2d Crown CA wmk (SG.42). (CDS) AP 26 04 on KE7 1d (SG.71). 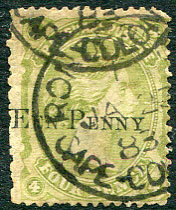 (CDS) FE 6 05 on pair KE7 ½d (SG.70), corner crease. (CDS) JU 14 05 on KE7 1d (SG.71). (CDS) SP 19 96 on 1/- (SG.67). (CDS) JU 20 82 on "3" on 3d pale dull rose (SG.37). (CDS) AP 7 08 on KE7 1/- (SG.77). (CDS) A/SP 27 99 on 1d (SG.58a). (CDS) C/JA 27 99 on CGH 1d (SG.58a). (CDS) AP 23 04 on KE7 1d (SG.71). (D/R) JA 9 05 on KE7 1d (SG.71) piece. (CDS) JA 12 06 on KE7 1d (SG.71), perf. fault. 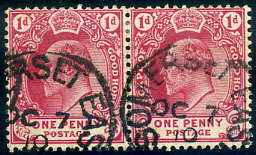 (CDS) NO 20 01 on ½d (SG.61a), the finer of the two recorded examples. (CDS) D/9 JA 01 on 1d (SG.59a). (SQC) B/FE 7 00 on 1d (SG.69). 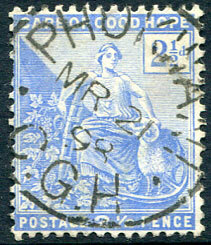 (CDS) MR 21 98 on CGH 2½d (SG.63), extremely rare. 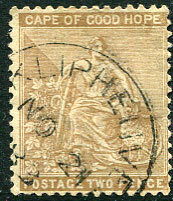 1st office opened JU 1 1896 and closed MY 1 1897, 2nd office opened MR 1 1899 and closed July 1899, no postmark seen by Putzel at time of printing his handbooks on The Postmarks of South Africa. 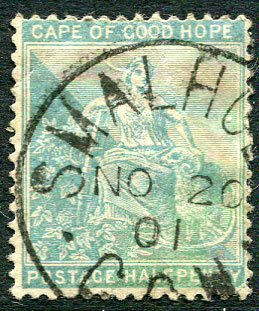 PHOWANI SIDING, however, was simultaneously open period 1897 to 1904 but no postmark recorded. (CDS) MY 6 86 on 1885 1/- green (SG.53). (CDS) FE 20 04 on CGH KE7 1d (SG.71), corner perf. fault. Very rare, few examples recorded. 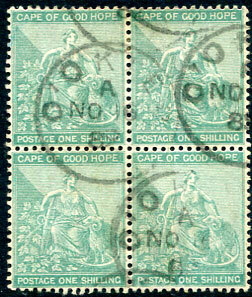 (CDS) 0/SP 29 08 on KE7 ½d (SG.70). (CDS) A/JU 2 02 on 4d (SG.56), corner bend/crease. (CDS) A/3 OC 05 on KE7 1d (SG.71). (CDS) B/23 JU 92 on 1/- (SG.53a). (CDS) A/JY 17 04 on KE7 1d (SG.71). 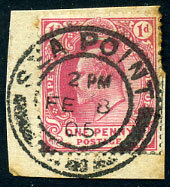 (CDS) AP 21 99 on 1/- (SG.67). 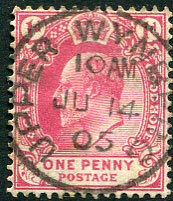 (CDS) A/AP 12 -- (without year) on 1/- (SG.67), creased. (D/R) FE 17 2 on 6d (SG.52b). A/OC 11 04 on KE7 1d (SG.71). 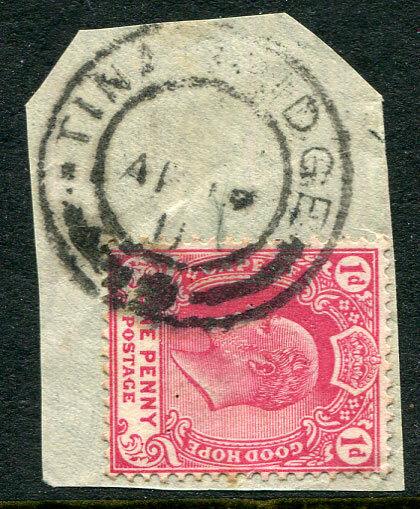 JY 24 94 on 5/- (SG.68). OC 2 83 on 2d (SG.42). SP 30 10 on KE7 1/- (SG.77). A/OC 30 (9)3 on 1d (SG.49). 18 JY 93 on 1d (SG.49a). 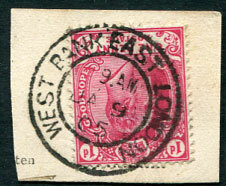 AP 25 88 on 1/- (SG.53). 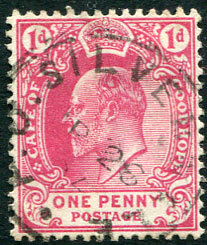 post interprovincial period use dated DE 13 13 on TVL 1d ovp'd "E.R.I." (SG.239), perf. defects at base, unusual. NO 17 09 on KE7 6d (SG.76). SP 4 10 on KE7 6d (SG.76). A/MR 14 93 on 1d (SG.59a). OC 7 10 on pair KE7 1d (SG.71). FE 8 05 on KE7 1d (SG.71) piece, toning.